In their long and illustrious 3 3/4 inch, swivel-armed, battle-gripped careers, the G.I Joe crew has never faced a more formidable mission than the one to rescue their celluoid souls. After their utterly forgettable 2009 big screen debut, the Joes needed a moment to regroup - refocus - on the task at hand: Saving their cinematic asses. With the onset of G.I. Joe: Retaliation, I can safely declare: Mission mostly accomplished. Picking up where its frenetic mess of a predecessor wrapped up, we find the Joes going all Zero Dark Thirty with an extract-a-nuclear-warhead raid in Pakistan. 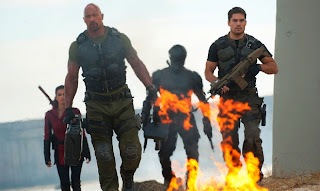 Several Joes from Cobra's last "rise": Ripcord, Scarlett and Heavy Duty are out, new recruits: Roadblock (The Rock), Lady Jaye (Adrianne Palicki) and Flint (D.J. Cotrona) in. With Cobra's resident chameleon, Zartan, masking as the president (a devilishly-delightful Jonathan Pryce), the Joes' keeping-the-globe-safe-from-Cobra marching orders are shredded with the elite fighting force slashed to a quartet, led by the current WWE belt holder. While he's by no means the most polished thespian on the planet, The Rock's addition is key to the substantial uptick in entertainment value this go around. The cartoonishly-swoll, sponsored-by-Under Armour, part-time pro wrestler was born to wield a gun the size of a canon and deadpan lines like: "Damn ninjas". And speaking of ninjas, the still-speechless Snake Eyes is the centerpiece of director John M. Chu's (Step Up 2 and 3) stunning signature scene, ziplining down the Himalayas with a horde of star-throwing assassins on Eyes' Johnny Cash-uniformed tail. It's Cirque du Soleil: Snake Eyes, even if the film's 3D - which was added during the nine-month release delay - is largely flat and frankly, pointless. Cobra's ninja, Storm Shadow, gets a solid chunk of the tale, with Byung-hun Lee shining as the samurai sword-swinging shinobi. I could easily see Lee headlining his own project – and soon. Bruce Willis shows up late in the game, doing John McClane minus the yippee-ki-yay as the "world's first Joe", owner of an ungodly arsenal of munitions. Watching the Joes rifle through Willis' suburban home, uncovering all manner of weaponry is cringe-worthy in the wake of the Newtown tragedy. It's straight gun glorification that Hollywood needs to rethink at some point in the very near future. Political statements aside, G.I. Joe: Retaliation is precisely what you want it to be, an action flick that administers exhilaration without a Michael Bay level of enervation. Is it absurd at times? Child please. My fave moment of ridiculousness: The Joes inability to quickly determine it's Zartan who's encased in the president's skin. You'd think the imposter's secret service detail sporting Cobra lapel pins would eliminate any confusion.